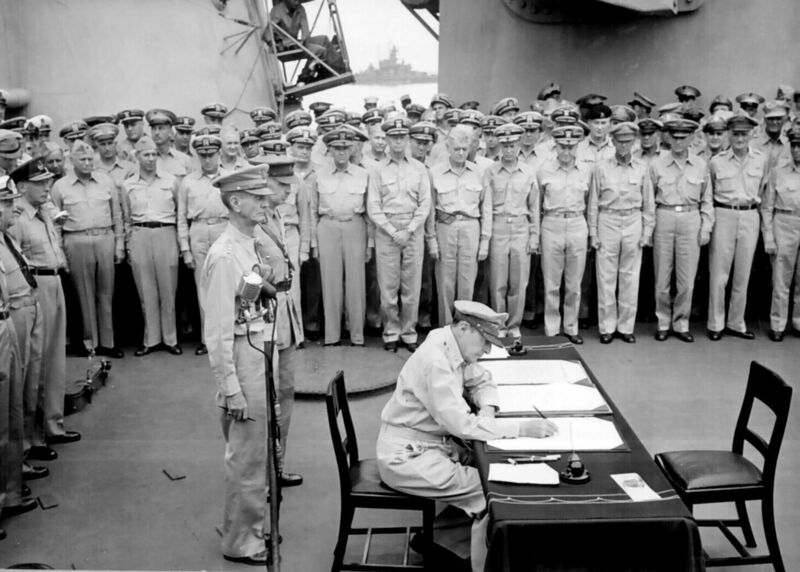 General MacArthur signed Japan’s surrender document. Japan lost almost all at the end of the Second World War. Major cities were turned into burnt ruins by air raids. Overseas territories had to be renounced. Supply shortages and inflation hit ordinary people’s lives directly being already poor. Extreme food scarcity caused starvation. Disabled solders were seen on the streets everywhere and always. Strangely, however, atmosphere at the time was positive. In wartime, light devises must have been covered with black cloth at night due to light control to avoid air raids. When the wartime blackout was gone, lives literally returned to light. The huge hit of the times was “Ringo no Uta” or “Song of the Apple” which is comforting, refreshing and hopeful. Two men described their feelings as “Survival and Hope”. Well, although the war casualties were enormous, they, survivors themselves, thought that they still had hope. The men were Masaru Ibuka and Akio Morita, and “their hope” would lead to “Sony” which is an industrial giant in audio equipment manufacturers. In a familiar story, a great pair leads an organization. Take Babe Ruth and Lou Gehrig for example. All of the Americans, even if you don’t like it, know well the good combination of New York Yankees with great tradition has owed them too much. The Sony founders, Masaru Ibuka and Akio Morita was the same as the legendary heroes. They knew each other since the pre-war period and founded a small company May 7, 1946. The name was “Tokyo Tsushin Kogyo” or “Tokyo Telecommunications Engineering Corporation” which was a featureless small factory. Though, only an interesting feature is the Founding Prospectus. Just reading this description motivated engineers. Well, although the ideal conflicts the real in some cases, in an ideal factory, Sony’s new products would make a splash across the World. By the way, Ibuka had an experience of failure to the entrance exam to Toshiba. However, the young man would establish a big business equal to the traditional company. The fate of human beings cannot be predicted at all. The original intent itself of “a spirit of freedom and open-mindedness” has invented unique products attracting consumers. Sony’s products are always novel and its designs are very cool! I would like dictionaries to contain “Sony” as an antonym of “mass production of inferior goods”. But then, at the time of founding, “Tokyo Telecommunications Engineering Corporation” did not always get cool products out the door. There was days when they sold Electrically heated cushion immediate post-war years. Then “Tokyo Telecommunications Engineering Corporation” moved to a new head office with factory equipment. They worked on the development of tape recorders. Sound used to be just listened to. Ordinary people could not imagine recording their own voice. In those days, Sony came up with a product which can record and play back actual voice using magnetic tape. The characteristics of Sony are the marriage between playful mind and prime technology. However, first-made tape recorders completed with great efforts was hardly salable due to the high price and heftiness with 35kg. After overcoming the disadvantage, simple, convenient, and reasonably priced new type of tape recorders were manufactured, trimming weight to 13kg. We can say that Sony as an electroacoustic apparatus manufactures got started from then on. The completion of this tape recorder of the type-H was in 1951 when only 6 years had passed since their foundation. This radio was not a product by Sony. In the now, the company logo cannot be read. Radios used to incorporate vacuum tubes into a large box. The size of this type is almost equal to that of a microwave oven. A fixed electric code prevent radios from freely moving. So, they are stationary appliances. However, transistors, the cutting edge of technology of the time, would make radios more compact and shock-proof compared with vacuum tube radios. All the more, transistors were very expensive. Though, Sony overcame difficult problems and could make it at last. They developed compact transistor radios like the Image 7 in 1955. Just two years later in 1957, the world smallest radios of the Image 8 were produced at a large scale. Sony in business for only twelve years made a great entrance into global marketplace. The company’s name “Tokyo Telecommunications Engineering Corporation” also compactly altered to “Sony” which started to make a great breakthrough. For most of history, something appealing always leads generations. Literature and art used to play its role, but now “products” replace their parts. As far acoustic equipment, Sony has been always ahead of our times and sparked buying motivation. Obtaining and utilizing Sony’s products have been a symbol of plenty, above all being cool. Here, I introduce Sony’s history of products predicting the trend of the future. Like old radios, television sets used to be heavy and bulky. During years of high economic growth when television sets became widespread, housing shortages were a big issue due to the outflow of rural population to urban cities. The Miniaturization of home electric appliances was, in a sense, inevitable. However, compactness never causes low-performance. This was demonstrated by the most light-weight micro television sets in the world like Image 9 developed in 1962. In 1953, Japan began television broadcasts for the first time. Like a flash, color television took the place of black-and-white television. Once again, Sony led the development of color TV. Old type screens of tube television looked like a big magnifying lens whose surface was rounded. However, since new aperture grille named Sony’s brand “Trinitron” was developed, TV lines made a leap forward and its screens became more flat. “Trinitron” was synonymous with TV itself and kept a strong brand. Sony took on unstoppable momentum. Once it was impossible to record pictures in TV at home. There was no choice but to use an 8mm movie film camera and shoot a television set itself. How miserably! In addition, you couldn’t play pictures without a movie projector. Surprisingly, Sony launched to develop video recorders for home use. In terms of the common sense of the day, people thought large-size reel-to-reel devices were required to record TV pictures. Against the odds, Sony successfully produced compact and cassette-system videotape recorders for household use. Although my family was not especially well off, my father, an early adapter, rapidly purchased this product. Once, neighbors came on a live TV program but they could not see it. And then they came to my home and see themselves on TV closely. I somehow feel proud, though, it was owed to the curiosity of my farther and Sony itself. Sony’s products have changed our lifestyle. Music used to be enjoyable only in rooms or concert halls. However, thanks to the appearance of Walkman©, high-quality sound music can be available while walking, getting on trains, and park benches. Walkman© made Sony a kind of an artist in a sense but a company of electroacoustic devises. This product changed conventional street scenes and it has become common that people with a headphone walk on the street while listening to music. Although Sony gained an edge on its technology, it suffered a defeat due to the weak business strengths. It is, what is called, “Videotape Format War”. Betamax format developed by Sony was overwhelmingly superior to VHS format. However, paradoxical fate confronted Sony. Strangely, VHS format won dominant share in the domestic market. It was caused by the channel that Matsushita Electric Industrial (The present name is Panasonic) had the network of numerous affiliating retailing stores by which Matsushita sold VHS format videotape recorders. It was like human wave tactics. VHS cassette tapes are more bulky than Betamax ones whose picture quality is obviously more beautiful than VHS format when comparing nearly equal playback modes. In spite of those facts, Betamax was defeated. If mass retailers had exhibited all types of products by each manufacturer as what it is today, and customers could have selected the better, Betamax could have won. Thinking so makes me, just a customer, regretful. Sony which was outnumbered in VTR format launched counterattacks from other places. The field was the market of video cameras. In 1985, Sony completed first 8 mm video format. The size of cassettes was minimized smaller than those of Betamax, which meant absolute advantages for video cameras being carried around. This type of cameras were finally minimized to the size of a passport and became explosive popular. At first, Nintendo gave spurs to video game consoles but today Sony’s PlayStation dominates their commercial market. New product development always causes new format war in which Sony defeats Sega Saturn. It is because various software are available to PlayStation and its stylish design wins the heart of adults as well. In high definition optical disc formats, HD-DVD of Toshiba withdrew from the market and Blu-ray led by Sony are completely victorious. Although Toshiba used to be one of a Betamax group, yesterday’s friend could be tomorrow’s enemy in the world of severe competition. For this reason, technical experts of advanced technology always has motivation to provide superior and more attractive products for customers. Sony has inherited the founding spirit of an ideal factory. As a child, I did not obey my parents. In spite of such personality, there are only two things I have followed. One is a favorite baseball team. Second is to purchase Sony’s products which my father was confident in the manufacturer. The baseball team has been no way out, but Sony hasn’t. I am sure that Sony will bring new products thrilling and exciting our customers! From now on, I am going to watch a movie with a Sony’s Blu-ray reclining on the sofa. My heartfelt thanks to the photos offered specially by c Sony Corporation. Here are some tips when you choose chopsticks. How to get from the airport to the city by train? Previous PostJapan’s expressways are full of entertainmentNext PostOsaka is a Garish but Romantic City of Waterways.